Burris is expanding its line of Eliminator range-finding Laserscopes. Burris is rolling out three new Laserscope models: 4-16x50mm Eliminator III, plus 4-12x42mm Eliminator II, and 3.5-10x40mm Eliminator. The innovative Eliminator technology, first introduced in the original 4-12x42mm model, combines a variable-power zoom optic with a built-in Laser RangeFinder. 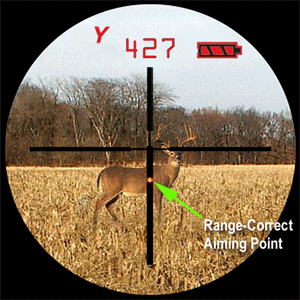 The range-finder calculates the distance to your target, and then displays a red dot range-corrected hold-over point. Just put the dot on your target and pull the trigger. You don’t have to spin your elevation knob. The new top-of-the-line 4-16x50mm Eliminator III is slimmer and less bulky than the original Eliminator. The Eliminator III features a new X96 reticle that will range at any magnification, and it offers a more sophisticated ballistics solver. With the Eliminator III you can now enter BOTH the bullet drop at 750 yards PLUS the ballistic coefficient (BC) for the specific bullet you are using. The Eliminator III’s X96 reticle also incorporates a new windage compensation system of dots that show lateral hold-off points. By using the dots, you can compensate for wind-drift without dialing the windage knob. The digital readout displays a 10 MPH Wind Value as a “Dot Value” for the shooter’s specific cartridge at the indicated range. Suggested retail price for the new Eliminator III is $1,499.00. The new 4-12x42mm Eliminator II laserscope features the X38 reticle. Burris claims the Eliminator II can range to 999 yards, but we suspect that’s optimistic. We are pleased that the new Eliminator II comes standard with angle compensation that helps hunters make uphill and downhill shots. The Eliminator II comes equipped with a remote activation switch that can be attached to the firearm’s forearm or the scope’s objective bell. Like the other Eliminators, you can program the ballistics solver for different guns/loads. Suggested retail price for the Eliminator II is $999.00. 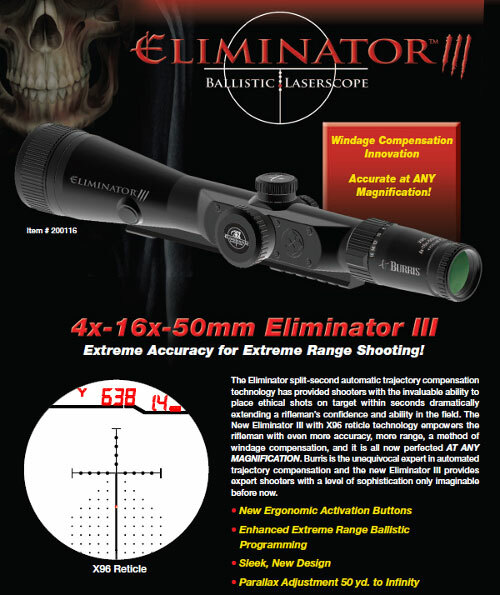 The new Eliminator 3.5-10x40mm is similar in design to the original Eliminator. The 3.5-10x40mm ranges out to 800 yards, with a ballistics solver you can program for any gun/load. The 3.5-10X Eliminator must be set to 10x power when ranging targets or trophies. Suggested retail price is $799.00. The original Eliminator 4-12x42mm was the first affordable laser rangefinding riflescope, and now there is a $100 rebate on the first-generation 4-12x42mm Eliminator, making it even easier to fit within your budget. Visit www.BurrisOptics.com for more information. Share the post "Burris Expands Line of Eliminator Laser Rangefinding Scopes"
It’s good to see this system continuing to develop, but I suspect Burris still hasn’t covered those calibres where it would come in most useful, i.e. where every shot requires trajectory and wind compensation, namely rimfires and air rifles. If they would make the Eliminator work for velocities as low as 600 FPS, ranges as low as 15 yards, and BC’s as low as .007 it would be a great small game and varmint scope. I suspect very few people would consider buying a two-pound, $1,000 scope to put on their $120 plinker rimfire or air rifle. It would not be worth it for Burris to pursue this market with such technologically advanced product. It will be a while before this technology becomes affordable enough for plinker use at 15 yards. you’re utilizing? I’ve loaded your blog in 3 different web browsers and I must say this blog loads a lot quicker then most. EDITOR: The secret is having dedicated servers, with lots of RAM and database optimization at the server level. We also have split delivery of text and graphic content. Sorry we can’t reveal any more specifics for security reasons. Reply to Paul Daisy – here in the UK, we dont have easy access to rifles except for Air rifles, which can easily cost $3000 up. We are limited to 12 ft.lbs so our ranges are quite limited. I would pay $1000 for an air-rifle version to allow me to extend my range out or maybe use a havier caliber… You see, there are more coutries out there than just the US of A!!! Make one for crossbows and, they will sell big time. We have only been asking for years now. Make it! Burris must create a scope with this technology to use in Field Target .177 rifles. For sure it would sell millions. Air rifle version please…. we have top range air rifles that go for 2000 to 5000, even 8000 dollars…. a burris eliminator for air rifles .177 to larger air rife calibers would sell heaps…. AIR RIFLE MARKET BURRIS, DONT MISS OUT.